Ivory Coast manager Sabri Lamouchi surprised many by removing Kolo Touré, but most importantly placed Didier Drogba on the bench, a move which can described as “brave”. 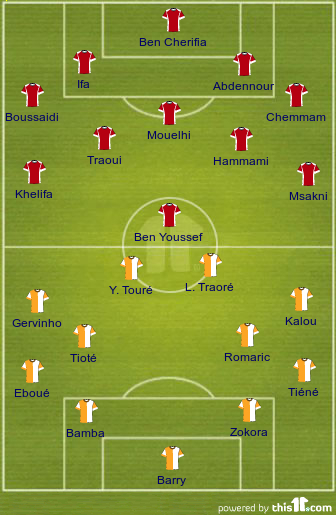 Romaric and Lassina Traoré started in their places, whilst Tunisia, faced with Issam Jemâa’s tournament-ending injury, now had Fakhereddine Ben Youssef as the sole striker and replaced Walid Hichri with Anis Boussaidi. The first half was completely dominated by Ivory Coast, making plenty of chances within the first few minutes, from Romaric and Kalou. The first goal came at the 20 minute mark. A quick and skillful one-two between Traoré (who had just had a shot saved by the goalkeeper) and Gervinho, who struck the ball high into the back of the net from inside the 6-yard-box. Tunisia struggled to maintain ball possession and whenever they lost the ball, they had a very tough time getting it back from an organized and technically more gifted Ivorian side. The second half began with Ivory Coast, um, coasting along the game, which allowed Tunisia to fight back somewhat with the inclusion of Oussama Darragi in place of Ben Youssef helping the Carthaginians but still without creating any meaningful chances that would bother Barry. The game eventually plateaued, with both teams balancing themselves out. Not even Didier Drogba coming on seemed to help the match much an Ivorian squad that could do with a goal to guarantee the win. The goal did come at the 87th minute. Siaka Tiéné lobbed the ball to Yaya Touré, who controls it nicely and from the edge of the box takes a curling shot that ended in the back of Ben Cherifia’s net. From that point, the Tunisians almost gave up, a point proven 3 minutes later, when Didier Ya Konan, who had come on the previous minute, made the best of Gervinho’s work to make the 3-0 and bury the match for good. The Ivorians become the first team to qualify to the next stage and go through as group winners. One would do well to not count his sparrowhawks before they hatch. Algeria had just recovered from a bitter loss to neighbours Tunisia, and were already plotting their route to qualification. Unfortunately for Les Fennecs, Adebayor and co had already drawn out a road of their own. Vahid Halihodzic responded to the press, who were outraged by his defensive approach, by switching from a 4-3-2-1 to a 4-2-3-1. Fullback Liassine Cadamuro lost his place to forward Hilel Soudani. His counterpart Didier Six opted for an increase in attack himself as centre-half Bossou conceded his place to Moustapha Salifou. Algeria found themselves on the front foot for most of the first half. A sprightly Feghouli prompted and prodded down Algeria’s right wing, winning corners and free-kicks. An early set-piece was well worked as the Valencian slid a nice cutback for Kadir who snatched at the bobbling ball. 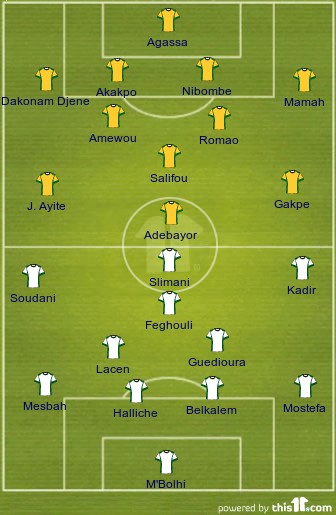 If Sofiane Feghouli was Algeria’s shining beacon of inspiration, Adebayor was Togo’s only attacking source of inspiration. He negotiated his way around the pitch displaying nifty touches here and there. In the 17th minute, Adebayor managed a step on Essaid Belkalem but his header went over- a sign of things to come. Exactly 15 minutes later, Adebayor headed a Gaffar Mamah clearance over to Ayite, who headed it into space which Adebayor latched on to. This time, Belkalem could do nothing to influence the Tottenham striker’s finish. 1-0 Togo. Algeria didn’t let Adebayor’s goal influence their rhythm as they continued to attack. But a resolute axis of Nibombe and Akakpo forced the Algerian forwards to the sidelines were they launched limp cross after limp cross. Kossi Agassa must also be commended for the command of his area. Only once did he fumble the ball, but even then it was quickly recovered. The teams emerged unchanged after 45 minutes. One difference noted was the urgency exhibited from the Algerian camp. Two successive penalty shouts frustrated Les Fennecs as captain Lacen was booked for dissent. Even more frustrating, from an Algerian standpoint, was Foued Kadir’s end product as he was withdrawn for the more experienced Yassine Bezzaz. Didier Six then made a substitution of his own as he brought on Dove Wome to tighten any gaps in the Togolese defense. But Algeria bore on. Adlene Guedioura stepped up to try and knock a dent into the Togolese defense. His first, from about 40 yards out, sailed about 40 yards over. A more determined Guedioura continued as he eliminated a defender and blasted another; this one had Agassa scrambling across his goal. Guedioura’s third and final attempt came from a constructive Algerian attack which concluded in a lay-off from Feghouli and a powerful shot from Guedioura, but it was aimed at Agassa. Togo struggled to find any rhythm as the final whistle loomed. The break in Algerian momentum coincidentally arrived with a break in apparatus. Adlene Guedioura charged into the 6-yard box for yet another cross and ended up dislodging the goalposts. When play finally resumed, Togo looked refreshed. Algeria resorted to long balls which were nodded away casually by the giant Dare Nibombe. Togo finally punched in their seconds of the night as Dove Wome raced passed an out-of-position Djamel Mesbah and poked a finish under M’Bolhi. Algeria will have felt hard done by as they had played well in both of their group matches. But such is the nature of football, and it’s why we love the game. Nibombe, a 32-year old veteran, measures at an astounding 1.96m (or 6 feet and 5 inches). His height was essential in nullifying the Algerian gameplan. If it wasn’t Nibombe making a clearance, it was Agassa collecting. The big defender was nearly betrayed by his teammates a couple of times, as penalty shouts nearly undid all of his hard work.